The 2018 Chevrolet Silverado trims give Bolingbrook drivers dozens of opportunities to build the ideal truck for any application. Whether it’s the practical power of Chevy’s impressive Work Truck or the luxurious appointments that can only be found in the High Country, the Chevrolet Silverado delivers. 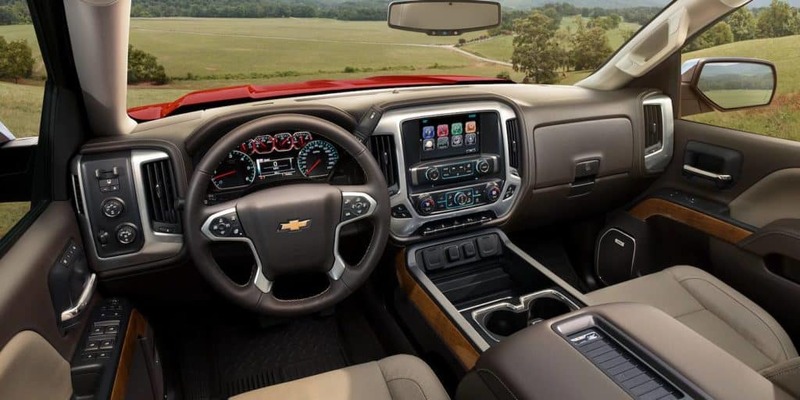 Explore the individual touches here, then stop by Chevrolet of Naperville to learn how easy it is to upgrade your ride with the new Chevy Silverado of your choice. The base trim is powered by a 4.3 L EcoTec3 V-6 engine capable of 285 hp and 305 lb.-ft. of torque. The LS adds power Windows, remote keyless entry, OnStar guidance, heated exterior power mirrors, deep tinted rear glass, and exterior chrome touches. The LT Z71 upgrades to an automatic locking rear differential, Hill Descent Control, standard fog lamps, as well as trailering and Z71 off-road packages. High Country is powered by a 355-hp 5.3 L EcoTec3 V-8 engine and features Bose premium sound, leather appointments, remote start, heated seats and more. Silverado LT: The LT is a step up from the LS trim and adds access to features like body color mirror caps, 17-inch bright machined aluminum wheels, EZ-Lift and lower tailgate, Chevrolet MyLink audio system with 8-inch diagonal touchscreen display, SiriusXM satellite radio, tilt and telescoping steering wheel, and more. Silverado Custom: The Custom is equipped with additional standard features that include a locking tailgate, rear folding bench seat, rubberized vinyl floor covering, and can be equipped with the Custom Value Package that includes a custom convenience package, trailering package, and auto-locking differential. Silverado LT Z: The off-road capable LTZ trim offers access to an available 6.2 L EcoTec3 V-8 powerplant capable of 420 hp and 460 lb.-ft. of torque, as well as a standard automatic locking rear differential, external transmission oil cooler, standard trailering package, and more. These brief descriptions only scratch the surface. Explore the power and capability of the 2018 Chevy Silverado trims when you schedule a Bolingbrook test drive at Chevrolet of Naperville. Contact us today at (630) 246-4639 or visit our showroom at 1515 W. Ogden Ave in Naperville to see how easy financing your next adventure can be.